Barium Titanate Glass Microspheres are excellent for use as a functional retro reflective additive to paints and coatings. 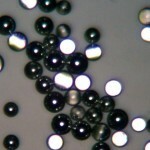 Spheres with sizes of about 50 micron (~0.002 inches) mean diameter provide a small enough size for most coatings while offering a large enough size to reflective a significant amount of light. Barium Titanate Glass Spheres are offered in both partially aluminum coated retro-reflective version for addition into transparent coatings, or as uncoated glass spherical powder for uses in colored paints. Barium Titanate Glass microbeads offers one of the highest indexes of refraction with an IR greater than 1.9 which provides high intensity retroreflectivity from these spheres. For those applications calling for a high density filler, barium titanate glass spheres offer a density of 4.5g/cc, that is almost double that of the more common soda lime glass spheres. In addition to a high density, barium titanate glass spheres have a hardness of about 55-65 on the Gardner scale and a crush strength of over 30,000 psi (207 Mpa) making these spheres very durable in high wear environments. The spheres offered by Cospheric as product ID: BTGMS (uncoated ) and P2453BTA (aluminized) are produced in the USA, and are Lead free.